Observation - Obs 7 - UK and Ireland. Description: This is a Sycamore Tree (Acer pseudo-platanus) which is fairly densely coated in green coloured foliose lichen. The covering has an odd patten almost like it has been poured on. There are a few areas of very dense coverage. 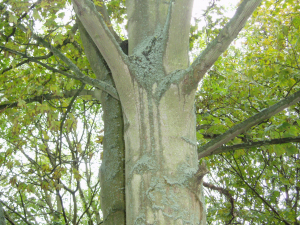 This is a Sycamore Tree (Acer pseudo-platanus) which is fairly densely coated in green coloured foliose lichen. The covering has an odd patten almost like it has been poured on. There are a few areas of very dense coverage.